The first round of the French presidential election, which takes place this Sunday, will be the next big test of whether the kind of populist wave that swept Donald Trump into the White House and carried Britain out of the European Union can maintain its momentum. Five major candidates are competing to qualify for the May 7 second round, which will feature Sunday’s top two performers. Current polls show a tight race, but most observers believe one of the two runoff candidates will be Marine Le Pen from the populist, far-right National Front. Led for many years by Marine’s father, Jean-Marie Le Pen, the National Front has a history of anti-Semitism and xenophobia, although the younger Le Pen has tried to soften its image somewhat in recent years, even expelling her father from the party for his extreme statements. In a 2016 Pew Research Center survey only about a quarter of French citizens (23%) expressed a favorable opinion of the National Front. The same poll provided insights into who favored the National Front and where they stood on key issues such as France’s Muslim community, globalization and the European Union. 1Support for the National Front is somewhat stronger among men, the less educated, and Catholics – though even among these groups, support is limited. In 2016, support stood at 28% among men, 26% among those with no college degree and 27% among self-identified Roman Catholics. 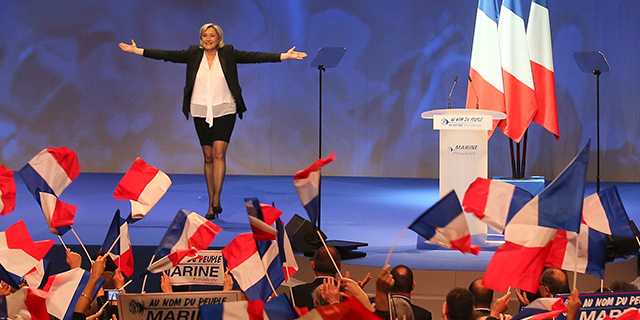 2Those who favor the National Front express much more negative attitudes toward Muslims. 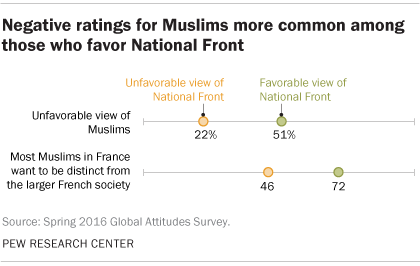 They are more than twice as likely as others to have a negative opinion about Muslims living in France, and they are also much more inclined to think Muslims want to remain distinct from the larger society, rather than adopting French customs and ways of life. 3Concern that refugees will have a negative impact on the country is higher among those with positive views of the National Front. Opposition to immigrants and refugees has been a mainstay of National Front platforms, and earlier this week Le Pen vowed to suspend all immigration to France. The 2016 poll found that support for the National Front was linked to negative attitudes toward the influx of refugees that has affected France and other EU nations over the past couple of years. People who have a favorable view of the party are much more likely than other groups to believe refugees take away jobs and social benefits, increase the likelihood of terrorism, and are more to blame for crime. 4People who like the National Front are more skeptical of globalization. Marine Le Pen launched her presidential campaign in February with a speech decrying globalization, and as the 2016 survey showed, the belief that involvement in the global economy has been a bad thing for France is more common among those with a favorable opinion of the National Front. 5The European Union gets low marks in France overall, but the EU gets especially poor ratings from those who see the National Front favorably. Only 30% of people with a favorable opinion of the National Front say the same about the EU.